BORDERING ON DEEP CAMEO! This is RARE! 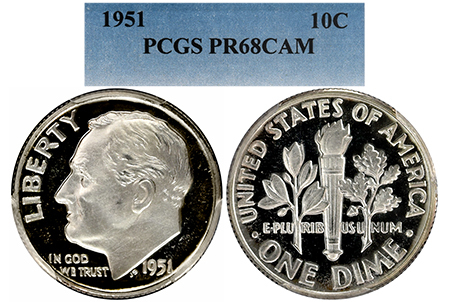 Finding a 1951 Roosevelt with this level of HEAVY Cameo frost is EXTREMELY scarce! It is 1 of just 35 examples graded in Cameo with only 1 higher in plus, and there are none grade in PF 69 Cameo! Matching obverse and reverse devices boat some of the heaviest frost to show up on a 1951 Roosevelt and sit on pitch-black mirrors that are flawless to the naked eye. This is one of the finest 1951 Roosevelt Cameos out there!